Cluster MACS J1206.2-0847 (or MACS 1206 for short) is one of the first targets in a Hubble survey that will allow astronomers to construct the highly detailed dark matter maps of more galaxy clusters than ever before. These maps are being used to test previous but surprising results that suggest that dark matter is more densely packed inside clusters than some models predict. This might mean that galaxy cluster assembly began earlier than commonly thought. The Cluster Lensing And Supernova survey with Hubble (CLASH) probes, with unparalleled precision, the distribution of dark matter in 25 massive clusters of galaxies. So far, the CLASH team has observed six of the 25 clusters. Dark matter makes up the bulk of the Universe’s mass, yet it can only be detected by measuring how its gravity tugs on visible matter and warps the fabric of space-time like a fairground mirror so that the light from distant objects is distorted. Galaxy clusters like MACS 1206 are perfect laboratories for studying dark matter’s gravitational effects because they are the most massive structures in the Universe to be held together by gravity. Because of their immense gravitational pull, the clusters act like giant cosmic lenses, amplifying, distorting and bending any light that passes through them — an effect known as gravitational lensing. Lensing effects can also produce multiple images of the same distant object, as is evident in this Hubble picture. In particular, the apparent numbers and shapes of the distant galaxies far beyond a galaxy cluster become distorted as the light passes through, yielding a visible measurement of how much mass there is in the intervening cluster, and how it is distributed. The substantial lensing distortions seen are proof that the dominant mass component of the clusters is dark matter. The distortions would be far weaker if the clusters’ gravity came only from visible matter. MACS 1206 lies four billion light-years from Earth. 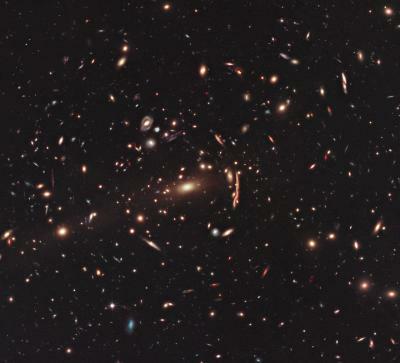 Hubble’s keen vision helped CLASH astronomers to uncover 47 multiple images of 12 newly identified faraway galaxies. Finding so many multiple images in a cluster is a unique capability of Hubble, and the CLASH survey is optimised to find them. The new observations build on earlier work by Hubble and ground-based telescopes. Among the observations which complement Hubble’s is a major project using the European Southern Observatory’s Very Large Telescope. Unlike Hubble, which is making images of the clusters, the VLT is carrying out spectroscopic observations, where instruments split up the galaxies’ light into their component colours letting the scientists draw inferences about many of the properties of the cluster galaxies, including their distance and chemical makeup. Taking advantage of two of Hubble’s powerful cameras, the Advanced Camera for Surveys and the Wide Field Camera 3, the CLASH survey covers a broad wavelength range, from ultraviolet to near-infrared. Astronomers need the diverse colours to estimate the distances to the lensed galaxies and to study them in more detail. Hubble’s unique capabilities allow astronomers to estimate distances to galaxies that are four times fainter than those that ground-based telescopes can see. The era when the first clusters formed is not precisely known, but is estimated to be at least nine billion years ago and possibly as far back as twelve billion years ago. If most of the clusters in the CLASH survey are found to have excessively high accumulations of dark matter in their central cores, then it may yield new clues about the early stages of the origin of structure in the Universe. Future telescopes like the NASA/ESA/CSA James Webb Space Telescope (JWST), a space-based infrared observatory now being built, will be able to study the fainter lensed galaxies in clusters like MACS 1206 in greater detail. JWST will be powerful enough to observe the spectra of some of the magnified galaxies and study their early chemical composition.